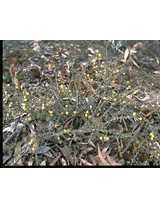 Description: Decumbent to erect shrub to 1 m high; branchlets ± terete, usually densely hairy with stiff hairs. Phyllodes ± triangular, ± straight, 0.4–1 cm long, 1.5–5 mm wide, glabrous or finely hairy, midvein prominent, sometimes towards lower margin, apex pungent-pointed; 1 gland along margin, usually with a prominent gland-angle on upper margin; pulvinus < 0.5 mm long. 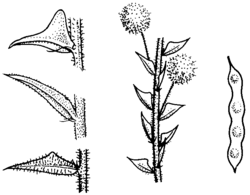 Inflorescences simple, 1 in axil of phyllodes; peduncles 4–15 mm long, hairy; heads globose, 20–30-flowered, 5–8 mm diam., cream-coloured to pale yellow or sometimes yellow. Pods ± straight, raised over seeds, slightly or irregularly more deeply constricted between seeds, 2–4 cm long, 3–6 mm wide, firmly papery to thinly leathery, glabrous or sometimes hairy; seeds longitudinal; funicle filiform. Distribution and occurrence: west to Parkes district. 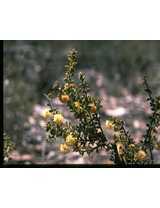 Grows in sclerophyll communities in various soil types. Other Australian states: Vic. Qld Tas. 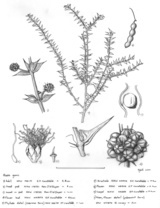 S.A.
A very variable species with hairy and glabrous forms and different phyllode shapes; specimens with narrow phyllodes and much-reduced phyllode angles are difficult to distinguish from Acacia ulicifolia. 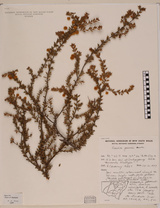 Also similar to A. pravifolia which has more than 1 main vein. 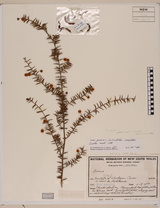 The species is named after Ronald Campbell Gunn (1808-1881), a prominent early Tasmanian botanist who collected the lectotype in Tasmania in the 1830s.